This commentary on the Feast of the Epiphany uncovers the meaning of the term epiphany and explains why the Magi — Caspar, Balthasar, Melchior, the three kings of Orient riding camels and carrying gold, frankincense, and myrrh — are found, complete with crowns and camels, in every nativity scene. Caspar, Balthasar, Melchior. These “three kings of Orient are” found, complete with crowns and camels, in every nativity scene. Yet if you look closely at the gospel account of the Magi (Mat 2:1-12), you won’t find these names. Actually there is no mention of how many Magi there were or that they were kings riding camel-back. This is a testimony to something some Bible Christians would like to deny: that all who read a text of Scripture do so in the light of some tradition, through some lens. If it is the right lens, it magnifies the text and allows us to get at its true meaning. If it is the wrong lens, we get a distorted image. It just so happens that the lens the Catholic tradition uses to read the story is derived from Scripture itself. To be precise, it flows from the connection between holy words written hundreds of years apart. But despite the many years and different human authors, these texts were inspired by the same Divine Author, the Holy Spirit. In chapter 60 of Isaiah (Is 60:1-6), it is predicted that at a time of darkness, the glory of the Lord will shine over Jerusalem. The heavenly light will be a beacon to the pagan nations and even to their kings. Here we find mention of camels whose job it will be to bring the wealth of these nations, including frankincense and gold, to the city of the Lord. Psalm 72 agrees that far off kings will bring gifts to the Son of David. The tradition of the Church has always seen the story of the Magi as a fulfillment of both Isaiah’s prophecy and Psalm 72. Hence the crowns and camels. But hold on. Isaiah 60 refers to only two of the gifts mentioned by Matthew: gold, fit for a king, and frankincense, for the worship of God. So what about the myrrh–where does that come from and what does it mean? Myrrh, an aromatic resin, was used in preparing the dead for burial. Gold reveals that the babe in the manger is actually a king; frankincense tells us that is he God incarnate; myrrh tells us that he has come to die. That someone would redeem God’s people through suffering and death was foretold by Isaiah a few chapters earlier (Is. 53). This was the really hard thing for those living in Jesus’ time to comprehend–that the same person who fulfilled all those prophecies about a glorious new king also fulfilled the prophecies about a suffering servant. All three gifts of the Magi are necessary to convey the true revelation, the true epiphany of who this child is and what he is destined to do. That’s why for hundred’s of years we’ve sung of three kings, not two or four. OK, so where did the names of the three come from? The ancient feast of the Epiphany actually celebrates three events, tied together by the meaning of the word epiphany as “appearance” or “manifestation.” Jesus suddenly appears as who He really is–messiah and God–to the Magi, at Cana when he works his first miracle, and when he is baptized in the Jordan. In the early Church, Epiphany was therefore second only to Easter vigil as the time to celebrate the sacrament of baptism. Blessed water from those baptisms were used to bless the dwellings of the faithful, and it became customary to write over the doorposts of blessed homes “C+B+M” meaning “Christ blesses this house (Christus bendicat mansionem).” Since the three kings were also remembered at the same time, someone decided to give them names, and to use CBM as their initials–Caspar, Balthasar, and Melchior. The names stuck. But the fact that Matthew gives them no names is telling. They may be kings, but in this story they are merely supporting actors. They follow the true Star, the King of Kings. Only His name is important. 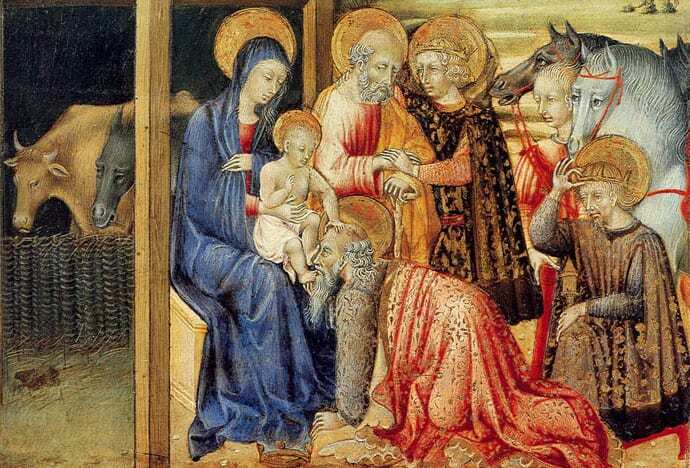 The Feast of the Epiphany is not about the Magi–it’s all about Jesus. For more great resources on the Epiphany, visit the Epiphany – Baptism of Christ section of the Crossroads Initiative Library.